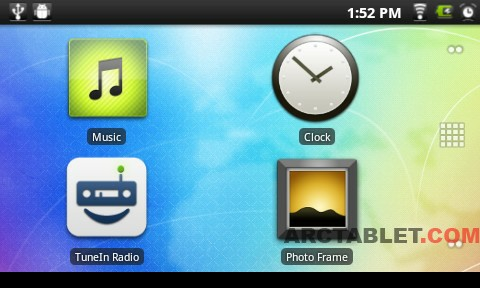 The picture above shows the homescreen where the four main applications are located: Music, TuneIn Radio, Clock and Photo Frame. 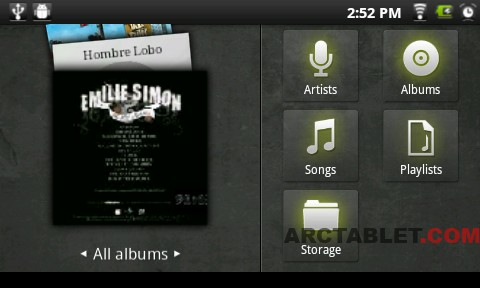 The Music application is a good heritage from other Archos Gen8 devices, this module lets you play audio and organize your music by albums, artists, or display album covers. 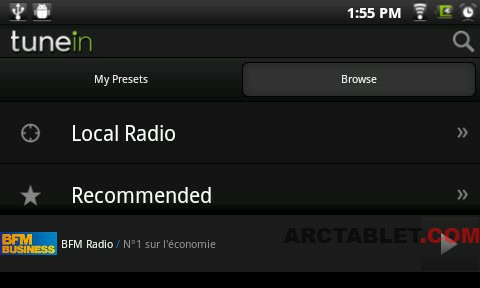 TuneIn Radio is a free online Internet Radio that lets you listen to over 50,000 stations all over the world. 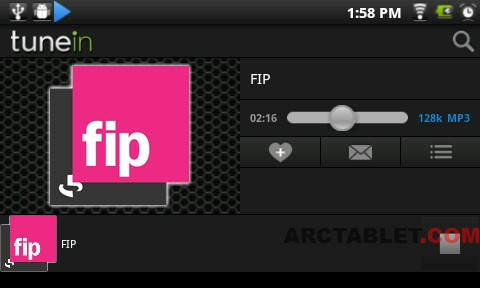 It covers all sorts of online audio content, from music, sports, news or current events. 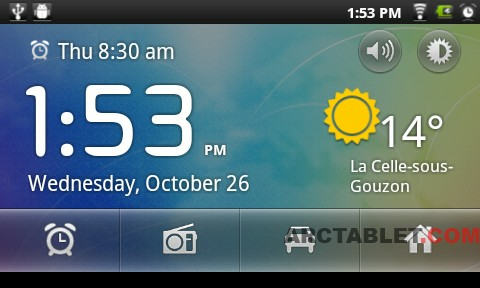 The clock application groups many features such as the alarm clock, TuneIn Radio application, car traffic information and weather forcecast. 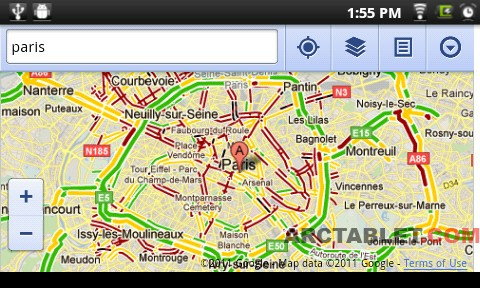 You can choose the location of your choice for the weather forecast and car traffic map. The alarm clock let you choose multiple ring methods: default ringtone, the music or the radio of your choice. Did you test skype with video calls on the home connect? 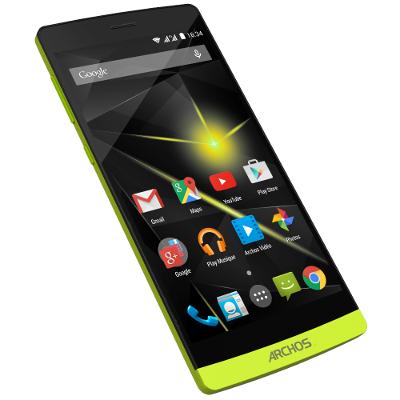 I just got the ARCHOS 35 Home connect; I've updated the OS to Android 2.2.1 (with internal updater). I think this is THE device for VIDEO CALLS. It's unique. It's very good for other functions such as web radio (excellent sound, and great choice of radios around the world), watching web TV, Youtube, Email, and even web browsing on websites not specific to mobiles ! 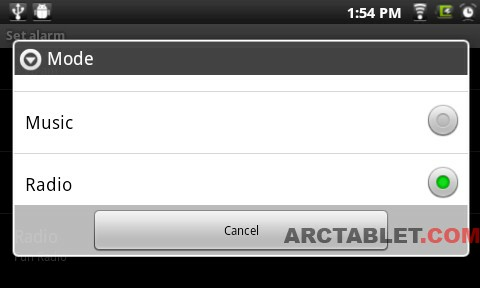 So, I've tried to install the latest version of SKYPE for ANDROID 2.2. No luck, couldn't install the latest 2.6.x.x. BUT, I've managed to run the SKYPE version 2.5.119. Video is excellent, but sound is "chopped". A newer version would hopefully fix this. I'm new to Android, so if anybody knows a good reason why the latest SKYPE 2.6.x for Android cannot be installed on this device ? An error message is returned, something close to "the device is not compatible with this software". Thanks for your feedback on the device. Does anyone now how to root the device?